In 2014, the American Council on Exercise studied the 10 most common shoulder exercises to determine the best shoulder exercise. See ACE study. The answer was that there is not ONE best shoulder exercise because the shoulder is a complicated joint with many attachments. 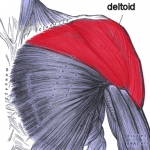 This study analysed the deltoid which is the most visible shoulder muscle. 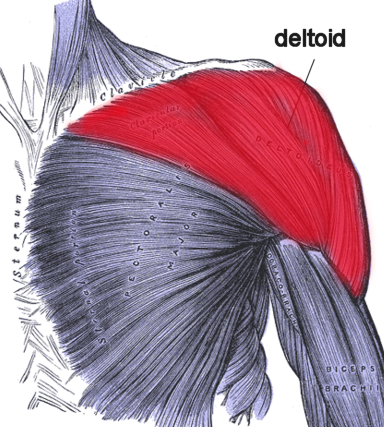 It has three distinct parts: anterior, medial and posterior. Although there is some cross-over each of these is trained with different strength training exercise. Doing just one of the exercises listed below would not not be sufficient on a regular basis….be sure to train your whole shoulder! That is a good question! Make the most of your time, don’t zone out…instead, zone in on your intensity level. 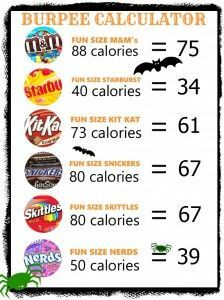 There are many ways to monitor your intensity level. This method was developed by Nautilus Institute. Recent research indicates that this method might actually be one of the most accurate ways to monitor intensity because it takes into account each person’s individual differences in fitness, heart size and experience. Challenge yourself with a High Intensity Interval Training workout twice each week. You will burn more calories and improve your endurance much more with High Intensity Interval Training than if you hang out in Zones 1 & 2 during your entire workout! Here are two core exercises you can do anytime, anywhere to strengthen obliques and glutes (specifically gluteus medius)….that’s the purpose of our exercise blog…to introduce new and fun exercises that you can do at home with little or no equipment because we know you can’t always get to the gym! Do it right: When performing this core exercise be sure not to cheat by using your hand to push off of the floor that way you will challenge the oblique abdominal muscles more effectively. Do it right: Get the most out of this exercise by placing your hand on your hip to assure your hips are stacked. If you allow your upper hip to roll back even a little you won’t recruit the gluteus medius properly. If you can do more than 10-15 of these without your glutes burning your are probably NOT positioned correctly. Here are two standing core muscle exercises you can do anytime, anywhere to improve your balance and strengthen core muscles….that’s the purpose of our exercise blog…to introduce new and fun exercises that you can do at home with little or no equipment because we know you can’t always get to the gym! Begin by balancing on one foot and draw and imaginary circle with your knee. Do ten circles in each direction. Repeat on the other side. Improve your balance, core strength and inner thigh strength. Complete 15 repetitions on each side. Here are two balance exercises you can do anytime, anywhere….that’s the purpose of our exercise blog…to introduce new and fun exercises that you can do at home with little or no equipment because we know you can’t always get to the gym! These exercises will improve your balance, flexibility and core strength. You might need a chair or a wall help you keep your balance when you first try these, but eventually your goal should be to progress to a point where you can balance without assistance while swinging your leg. Exercise #1: Forward/backward Leg Swings are a great dynamic stretch for both your hamstrings and quadriceps. Exercise #2: Cross-over Leg Swings will help to strengthen your abductors (gluteus medius) and adductors (inner thigh muscles).